Show Me The Movies: Review: Wonder - Heartfelt drama that lives up to it's title! 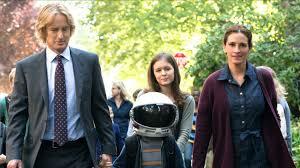 Review: Wonder - Heartfelt drama that lives up to it's title! In a year that has brought us a plentiful supply of superheroes, some chilling horror movies, wonderful animation features, many terrific biopics and a lot more, one particular genre that has been lacking has been the sentimental and heartfelt drama. A movie that can evoke tears of sadness and joy in equal measure whilst ultimately warming the hearts of the captivated movie audience. Thankfully, this particular hole has now been filled by the aptly named Wonder. Based on R.J. Palacio's New York Times bestseller, Wonder tells the incredibly inspiring and heartwarming story of August Pullman, a boy with facial differences who enters fifth grade, attending a mainstream elementary school for the first time. Under lesser capable talents than director and co-writer Stephen Chbosky this unashamedly old fashioned and sentimental tale could have come across as a bit twee and over patronising and whereas it does have it's moments of over sweetening it is by and large a warm and charming yet highly entertaining piece of film that contains a pretty strong life message. Chbosky's first feat in this production was assembling a strong and suitable cast. Owen Wilson dials down the goofiness just enough to endear himself to the audience as Auggie's father whereas Julia Roberts shows a strong return to form in her role as his mother. Mandy Pantinkin also lends a reliable hand to proceedings as principal Tushman. It is the younger members of the cast however that steal the show with Izabela Vidovic showing maturity way beyond her years in her wonderful performance as Via whereas Jacob Tremblay proves emphatically that his immense performance in Lenny Abrahamson's Room was not a one off. Smart writing along with those strong performances prevent this film getting too schmaltzy and what escalates is a powerful and sensitive drama that will have it's audience reaching for the tissues on more than one occasion but stands alone in it's field as a terrific heartwarming tale that does justice to it's ever popular and exquisite source material. Recommended!